Nanami Momozono is alone and homeless after her dad skips town to evade his gambling debts and the debt collectors kick her out of her apartment. So when a man she's just saved from a dog offers her his home, she jumps at the opportunity. But it turns out that his place is a shrine, and Nanami has unwittingly taken over his job as a local deity! Nanami has finally found the fallen kami who cursed Tomoe, but before she can rush home to save her beloved shinshi, she must watch the past unfold. But how will her relationship with Tomoe be affected by her standing witness to the torments he and Yukiji suffer?! http://degreesofaffection.booklikes.com Degrees of Affection 5.0 Kamisama Kiss Vol 17 - Finally the next volume...and what a volume!! 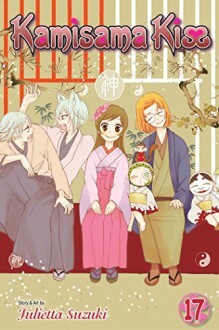 text Kamisama Kiss Vol 17 - Finally the next volume...and what a volume! !